Fair to say, many a lifelong sailor has never experienced 24 knots on a boat. Also fair to say, it takes a lot of 30-plus to turn out an average like that while logging 28,523 miles. On a new circumnavigation record. Which will, however, be computed for official purposes using, not the actual distance sailed, but the shortest-possible route of 21,760 miles yieldingwhen it becomes officialan average speed of “only” 18.76. OK. But to ring that bell, the 103-foot trimaran Groupama 3 sailed 28,523 miles at an average of 24.6, and that’s my reality. Skipper Franck Cammas and his other-than-Stan French crew entered the English Channel late Saturday night, local time, and by passing the French island of Ushant, completed the record circumnavigation. They took 2 days, 8 hours off Bruno Peyron’s 2005 passage in Orange and set the new mark to beat at 48:07:44:52. Also aboard were watch leaders Fred Le Peutrec and Steve Ravussin, helmsmen/trimmers Loïc Le Mignon, Thomas Coville and Lionel Lemonchois, and the three bowmen: Bruno Jeanjean, Ronan Le Goff and Jacques Caraës. 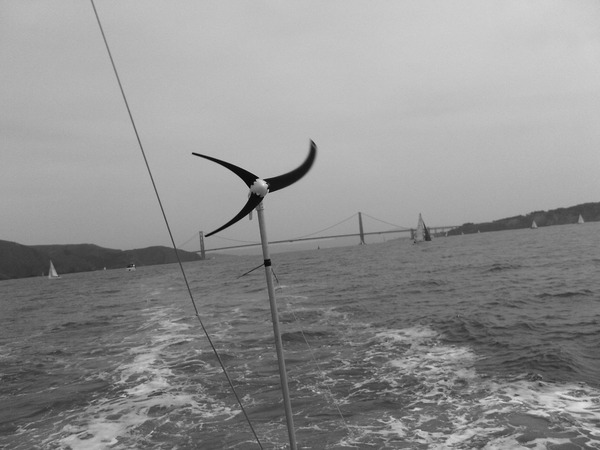 Their shoreside router, a critical component of the team was Sylvain Mondon. Last fall, Honey said that Groupama 3, blessed with optimum luck, was capable of a 45-day passage, but this was a come-from-behind record. 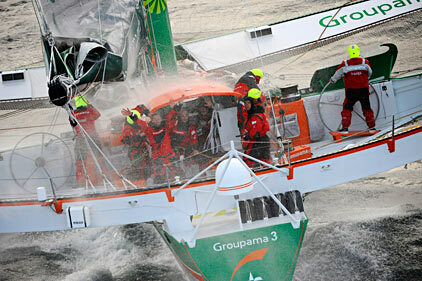 Groupama 3 was often running behind the reference times set by Peyron and carried a 500 mile deficit crossing the equator and entering the North Atlantic for home. A spot of bad luck right there would have cooked the goose—in November in the South Atlantic the boat broke an aft beam bulkhead, diverted to Cape Town for repairs, and then returned to France to restart. A miss on the second attempt would have been a bitter pill. But the North Atlantic leg was golden, six straight days going fast, and in. Peyron will be on hand in Brest to welcome the crew upon their arrival on Sunday morning. Click here to go along for part of the ride. Four years after the concept struck, David de Rothschild took his 60-foot recyclable catamaran, Plastiki, to sea on Saturday, bound from San Francisco to Sydney. With Rothschild are co-skippers Jo Royle and David Thomson, Olav Heyerdahl (a Thor Heyerdahl descendant; think Kontiki/Plastiki) and cameramen Vern Moen and Max Jourdan. Their goal is to dramatize the waste of single-use plastic and its damage to the oceans. They’ve been getting ink, so who knows, maybe it will help. But that was before they hung the rudder on a crabpot in the dark and had to go under the boat to clear it, and got becalmed, and moved on to the first of what could be 100 dinners at sea. As they cleared the Golden Gate, we looked like this to them . . .
On their way to the finals, Emirates survived by one second a heart-stopping last-minute penalty turn in their match against Azzurra, the other Italian team. Today they left no doubts with a composed and clinical performance that saw them threatened only once. The Emirates boat arrived to more applause, flying a gigantic New Zealand blue ensign plus smaller national flags of all the competing countries.